The BCAA tow truck driver showed up in about 20 minutes, which is exactly the time the BCAA dispatcher had estimated (and was more than enough time for me to take over the Pokemon Gym that was there), and he was super nice. Here was where I learned the first thing of this adventure: the location of the battery in my car! Now, lots of things in Smart cars are not where they are in other cars – the engine is in the back and the ignition is in between the driver’s seat and the passenger seat, near the gear shifter, for example. Well, it turns out that the battery is located under the foot well on the passenger side! Also there was the tow hook for the car! I’ve never needed to check my battery before – it’s never been a problem. And the only other time I had it towed was when I had a flat tire and that time it was still under warranty, so I had Smart Car roadside assistance still, and they just took care of it. I knew the battery was working, as I could still roll up my windows and the radio was still working, but the tow truck guy tested it, and decided that I would indeed have to get it towed somewhere, because whatever was making the car not start wasn’t something he could diagnosis on the spot. Now, I’ve never had any trouble with my car before and I’d only ever taken it to the dealership for its regular maintenance (while it was under warranty I had to take it there or else the warranty would be void and once the warranty was up, I just kept going there out of habit/being too lazy to find an alternative). Smart cars are sold at Mercedes dealerships, so you know that there is going to be a bit of a premium on their prices. But I really wasn’t prepared for how bad it would be! First, when I called the dealership to say I was going to have my car towed there, they said it was no problem even though they would be closed for the night, the driver could just drop off the car and put the keys in an envelope with my name and number on it through the drop spot they have for just such occasions. However, the next day when the service guy contacted me, he was all “We have 68 cars with appointments ahead of you, so we can’t even look at it until Monday and I won’t do anything until you approve the $200 minimum fee to diagnosis it. 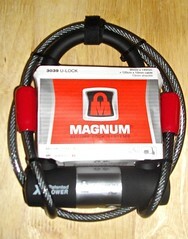 Plus it is due for a major service appointment (replace spark plugs, belts, oil, etc.) and that costs $970. So with have halted everything until you approve the fees”. My first thought is “why is he making a big deal that other cars have appointments. My car died with no warning. Sorry I didn’t make an appointment for that!” And my second thought was “why would I approve $1000 of maintenance if I don’t know what is wrong the car? What if it isn’t even fixable and they just do all that maintenance on a car I’m going to throw away?” So I said I’d pay the $200 diagnostic fee, but not approve the maintenance before I knew what was wrong with the car. On Monday, they contacted me with a diagnosis – the clutch actuator motor had died – and an estimate – $900 for the part, $800 for labour (including the $200 diagnosis fee). So in total they wanted $2700 + tax to fix my car, which is 8 years old and only worth about $4000 (if it weren’t broken!). So this made me an unhappy camper because I have a lot of more exciting things that I would want to spend $2700 + tax on, such as anything else. I would rather spend that much on pretty much anything else. Also, they would have to order the part of Toronto and it wouldn’t arrive until Friday, and that’s only if they placed the order that day (i.e., trying to pressure me to make a quick decision!). So this is the major car part thing that I learned: what the heck is a clutch actuator motor? I knew what a clutch was from my years of driving manual transmission. 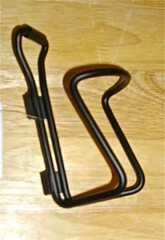 When you drive manual, you step on a clutch pedal, which allows you to shift gears (or to start the car moving from a stationary position) – basically, stepping on the clutch pedal disconnects the running engine from the turning of the wheels so that you can shift gears; then you release the clutch pedal, which allows the engine to continue turning the wheels with the car in the new gear you’ve just selected2. 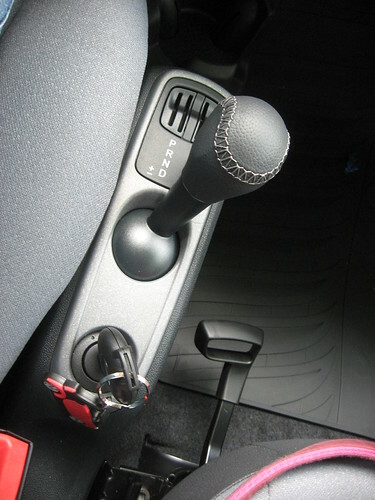 However, Smart cars don’t have manual transmissions – they have something called a Tiptronic – with this type of transmission, you can shift the gears yourself, but you don’t need to step on a clutch pedal and if you fail to shift correctly, the car will just shift it for you so that the car doesn’t stall. In the photo above, you see that there is Park, Reverse, Neutral, and Drive, which in an automatic car and you can just drive your Smart as an automatic using those. If you want to do the shifting yourself, when in Drive, you push the stick over to the left (where the + and – are) and then you push up (towards +) and release to shift up or down (towards -) and release to shift down. I did this when I first got my car, but it just wasn’t as satisfying as driving a real manual, so I’ve driven it as an automatic after about the first month of owning. Anyway, the clutch actuator is a part that basically takes the place of the clutch pedal that you would step on to change gears in a manual transmission car. So, the fact that the clutch actuator died and was making my car not work was like insult to injury – it’s a part that my car has because of a feature I don’t even use! So that was Monday. They didn’t have my car reassembled until the next morning, but I got a tow truck to take it to Deckers Auto in Burnaby, who had the car fixed and all the maintenance done in about 24 hours, and the cost was right on what they’d estimated! And to put a cherry on top, when I got there, the guy was super friendly and helpful, he showed me the parts that had been replaced and explained what was wrong with them, and basically treated me like I was a person capable of understanding information about cars (which many mechanics do not do when they speak to women.). He also told me that my car is in great shape, so I shouldn’t have to worry about it for quite some time! I was just so pleased with their service and I will be definitely going back to them for all my maintenance from now on. If you are ever looking for a great auto shop, I highly recommend them! my friend Tig who gave me a ride to our hockey game that night! Cross section of Smart car showing engine location is from Wikimedia Commons shared with a Creative Commons license. Gear shifter in my Smart car photo was taken by me! Yesterday, I paid off my car loan. Which makes me 100% debt free! While not quite as thrilling as the time I paid off my student loans, as my car loan was less than a quarter of my student loans, it still feel pretty good to have that monkey off my back. And now I own my shiny Smart car outright. Huzzah! For the record, there are three instances of 666 in that number. 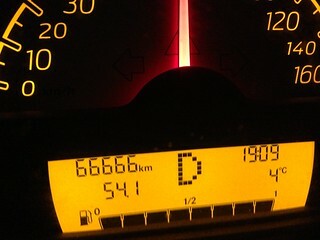 It seems like only yesterday 1,333 days ago, I only had 666 km on my car! They grow up so quick. Today was the day that I took my beloved Zaphod Beeblebrox the Car into Kal Tire to get her new tires, which, for a car, is like getting a new pair of shoes, except ones you have to wear nonstop for 3.5 years and nearly 65,000 km. And they cost $700. I was going to take a photo to show y’all, but they look exactly the same as the old tires. Rather disappointing for a new pair of shoes. 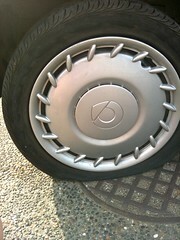 On the plus side, I feel much safer now that I have tires with tread! Also, I recently detailed my car. OK, someone taught me how to detail my car. OK, actually, someone who loves cars detailed my car for me and I sort of watched. And here’s the thing about car “detailing” – it’s just another word for cleaning. I’m assuming that they had to invent a different word for it because a guy would never admit to enjoying cleaning. But really, it just means cleaning your car like you have OCD. I think from now on I’ll be calling it “detailing my apartment” instead of cleaning. And here’s the other thing about car detailing: it actually makes a surprising difference to your car. We used the best of the best cleaning detailing products and they really did make the inside of my car shine. And smell good. And honestly, it makes it seem like your car is better after you are done detailing it. So now I think I’m kind of into detailing my car. Which is just awesome, because I barely have enough time in my week to do things like feed myself and ensure I have clean clothes to wear, so adding on another time sink into my life is a great idea. I Drive A Lot. And A Review of Fuelly. driven 45,609 km2 – that’s an average of 57 km per day! 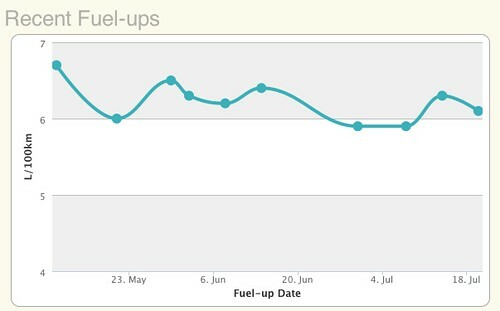 But I was recently introduced to Fuelly 4, a website that tracks your mileage for you… and gives you pretty graphs and infographics! Being a graph-loving nerd, I naturally had to try it out. Fortunately, Fuelly lets you import data so I could just import the data I’d been tracking on my handy dandy spreadsheet and viola – graphs! 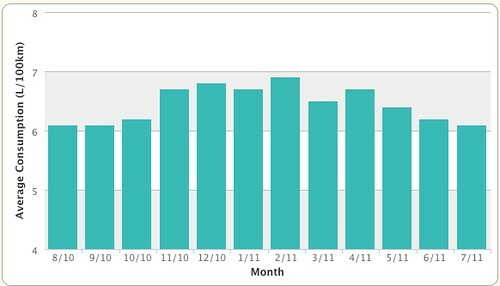 If you are interested in my ongoing tracking of Zaphod’s mileage – and who wouldn’t be, really? – you can “follow” me on Fuelly. My Shiny New Bike! It’s Shiny! 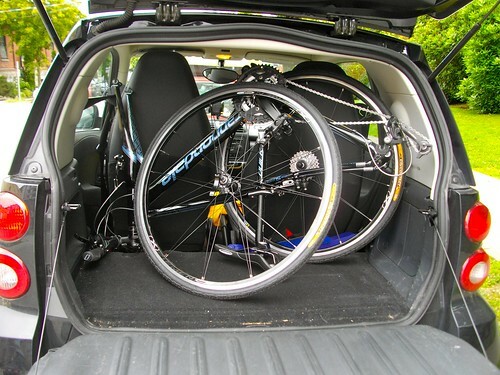 I finally found a hybrid bike that fits in the trunk of my Smart car! And it’s shiny and new and fun to ride and it’s sitting in my apartment right now because I bought it on Saturday! Item #73 on my list of 101 of things to do in 1001 days, consider yourself crossed off that list! 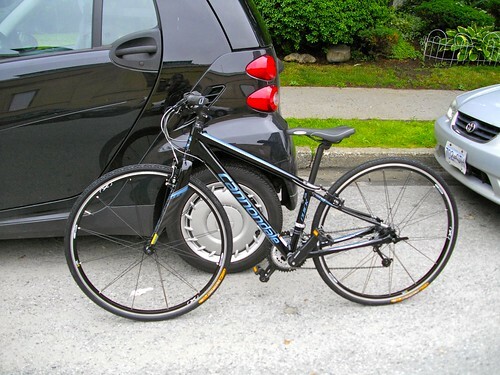 The bike that I ended up buying is the Cannondale Quick 3. It’s a sweet little hybrid with a carbon fibre fork, two quick release wheels, and a whole lot of awesome. 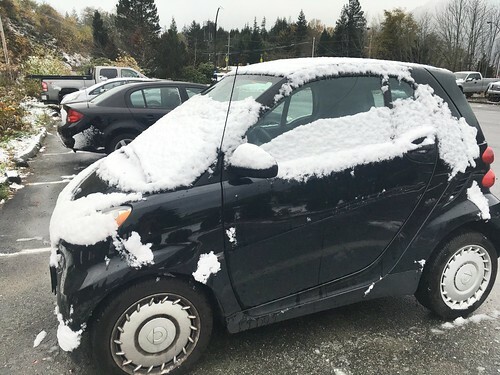 The best part, of course, is that I can fit it in the trunk of my Smart car! Thankfully, I’m very short, so my bike is the “petite” model (which is what Cannondale apparently calls their “extra small” bikes. ), which means its small enough to fit into my trunk. The quick release wheels take just seconds to remove and it’s really light, so it’s super-easy to get it in and out of my car. A thermos that seals tight and fits into the water bottle holder, in order to bring my coffee to work on days when I bike! I probably should get a few other things, like some lights and such, but I figure that we are still having fairly long days, it allegedly being summer1 and all, so I have some time before I need to figure that out. Because I have to say that this shopping for bikes and bike accessories has really made me feel like there are too. many. choices. The options for types of bikes2 and features on those bikes3 and what those bikes are made of, etc. – were rather overwhelming. And then I went to MEC and there were eleventy billion options for locks and pumps and really I just wanted someone to tell me what to buy! Anyway, I’m pretty happy with what I got, so it’s all good. I’m looking forward to taking her out for some longer rides – perhaps a seawall trip in the near future? As well, I’m planning to ride her to work when I can – the beginning of this week doesn’t look good for that, as I have meetings I have to get to and thus will need my car. But perhaps Thursday or Friday I will be able to! Also, I need to think of a good name for my bike5. Any suggestions? So when I got to work this morning, one of my coworkers, who was also just arriving, rushed up to my car. “You have a flat tire!” she said. And flat it was! 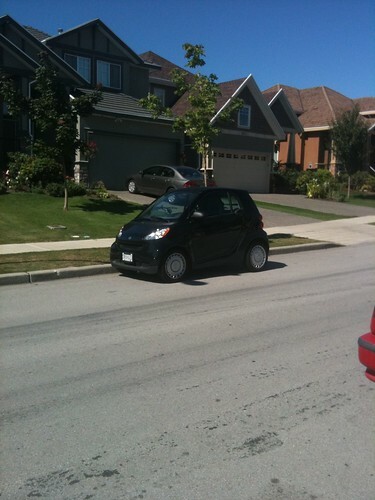 Now, you may have noticed that Smart cars are very small. But did you know that they are so small that they don’t come with a spare tire, because there is really nowhere to put it? So I called the “Smart Move Assistance” line – that’s the name of the roadside assistance that comes with your Smart car. The guy on the phone told me that since Smart cars don’t have spare tires, they’d have to call a tow truck driver to take me to the dealership to get it fixed or replaced. I was *supposed* to be going to Langley today to run a couple of focus groups, so I had a bit of a scramble calling a manager to get her to contact the attendees – the list of whom I had to find in my email on the web browser on my phone – to tell them *not* to go to Langley, since I wouldn’t be able to get there. Because *of course* this couldn’t happen on a day when I didn’t need to drive somewhere. I opted to go with the tow truck driver to the dealership, because I really didn’t have another way to get to the dealership to pick up my car1. Plus, since there was to have been a bit of spare time in between the two focus groups that I was intending to go to, I had some work in my bag that I could work on while I waited, so it didn’t really matter much if I was doing that at the dealership or in my office. Now, the tow truck driver was an interesting fellow. First, he was freaked out that I was in such a “dangerous” area full of “crackheads” and “did you see all the hookers just over there?” I was at King George Boulevard2 and 72nd, which, for my readers who are not from Surrey3, isn’t exactly the scariest part of town. I mean, I go there every day for work and have never felt the least bit scared4. Also, there is a police station within spitting distance. But apparently he figured he arrived just in time to save my life. During the brief drive to the dealership, he managed to fit in several rants, including one about his ex-wife who is now engaged to his ex-best friend and one about Asian drivers5. At the dealership, I learned that replacing one measly Smart car tire costs almost $300! WTF? That’s a lot of dollars! They did clean and vacuum my car, which is something that I’ve been meaning to do since forever. So procrastination FTW! 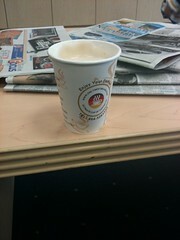 Terrible “cappuccino” from the machine at the dealership. 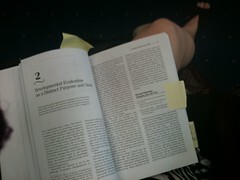 What I was reading while I waited for my car to be fixed. While I was there, I also asked about the cost of a Smart car bike rack, given that I’m seriously considering buying a bike. 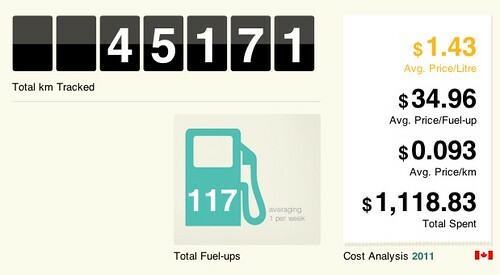 Would you believe that a bike rack for my Smart, including installation, costs nearly $1000?!6. And to think just this morning I was thinking “I have no idea what to blog about today!” Be careful what you wish for, Bethy! Happy Belated Car-iversary To Me! I can’t believe I forgot my own car-iversary! 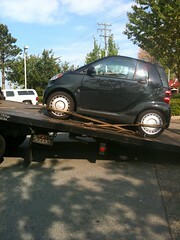 It was two years ago yesterday that I brought my bouncing baby Smart car home from the dealership. Clearly, I’m compensating for my giant IQ. 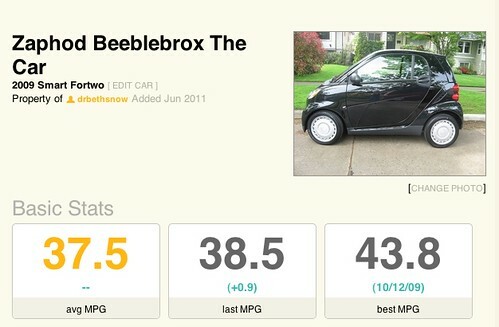 Happy car-iversary, Zaphod Beeblebrox the Car!